The F5 Corpus VS is a durable, powerful and stable front wheel drive power wheelchair combined with the best seating system on the market – the Corpus seat. The seating system is designed to effectively support the clinical, functional and lifestyle needs of active users. The latest version of the Vertical Stander (VS) offers all the power seat functions of the Corpus seat plus an innovative new way of standing, allowing you to choose from two positions, Sit-to-stand or Lay-to-stand. 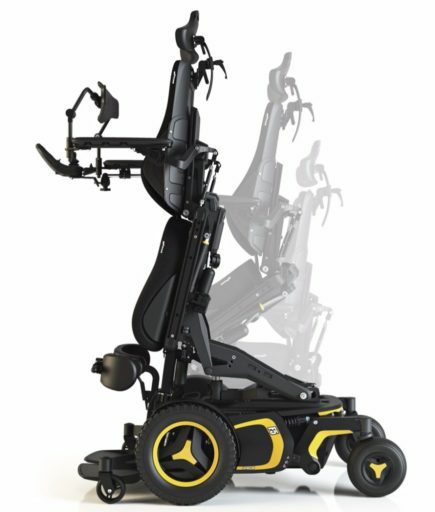 Giving you greater independence and freedom, the F5 Corpus VS features fully independent suspension and automatic, self-adjusting support wheels, providing a new level of comfort and stability, especially when you stand and drive, indoors or outdoors! A range of alternative driving controls for non-joystick drivers is available, as well as separate controls for assistants/caregivers. For transport purposes, the upper part of the backrest can be removed to reduce the overall size of the wheelchair.